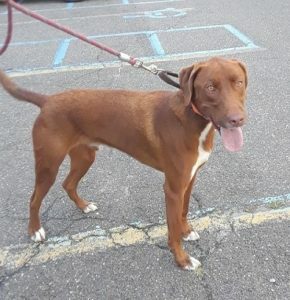 He’s a 17 month old chocolate Lab mix with an athletic Pointer physique. THORIN likes kids & other dogs. He is pushy and does jump up so he needs to be with kids 10 or older. He is an active youngster who comes to Last Hope from Amherst Humane in Virginia. THORIN is looking for an active, dog savvy home with someone who will channel his energy & teach him the basics of dog decorum. He knows SIT or DOWN but has to be in the mood to show you that he does. THORIN is an enthusiastic student. This entry was posted in Adult, Dog Center, Dogs, Male. Bookmark the permalink.